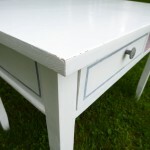 This simple, old table was a custom order. It was brought to me by one of my clients. 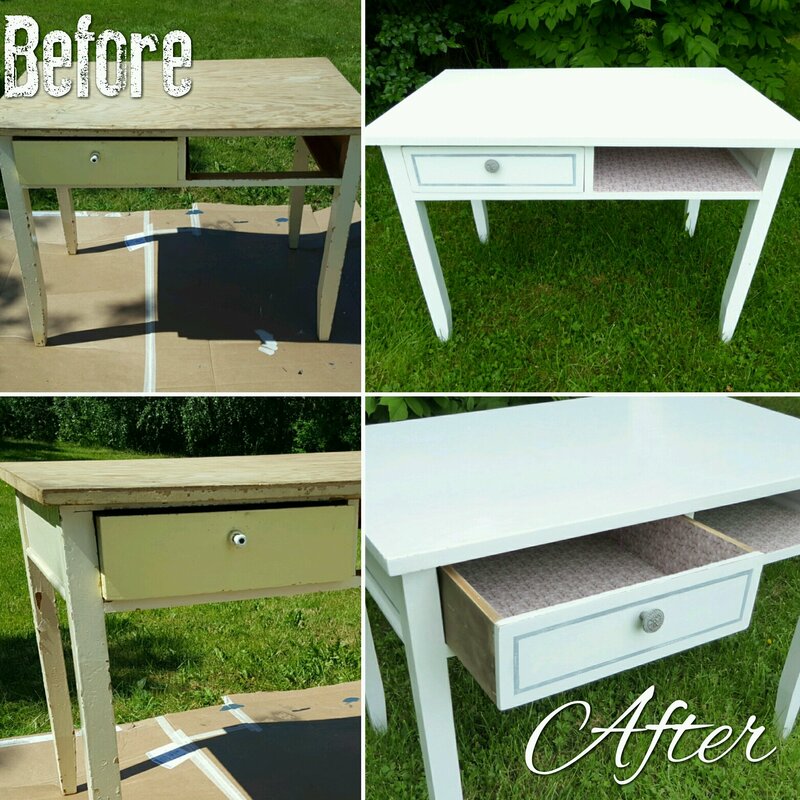 She wanted it to match the Shabby Chic buffet she bought from me some time ago. When I first saw it I wasn’t even sure I could manage to bring it back to life. It was missing one of the drawers and the old paint was literally peeling off it. The top plate was made of bad quality material and the whole thing was just sad and broken. 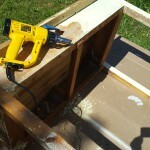 First I used my Dewalt Heat Gun (BEST TOY EVER!!! 🙂 🙂 🙂 ) to remove the old paint, and then I sanded the whole thing. 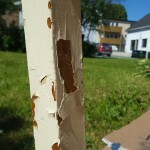 After that I primed it with Jotun Kvist-og Sperrgrunning and painted two layers with Lady Supreme Finish. Now it was time for the fun part: giving it a unique character. 😉 Since the client wanted it to be delicate and neutral, matching the pieces she already had, I had to keep it simple. 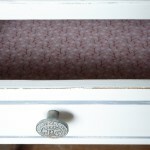 I chose a light pink paper for the inside of the drawer, and the shelf. Oh yeah, the shelf! 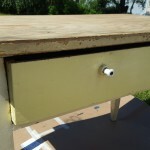 I made it to replace the missing drawer on the right side, since making an actual drawer would be to expensive and to time consuming for this kind of a project. 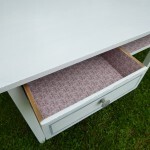 PS: If you’re interested in my drawer decoupage technique just check out my previous post HERE. Paint along the tape edge with the colour of the background, in my case white. 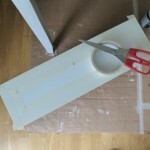 If the paint bleeds under the tape it’s the same colour as the base wich makes it unnoticeable. 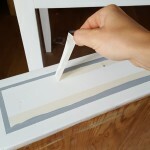 You seal the edge with the first colour, allowing it to bleed under the edge, so the second colour does not. Give it 10 minutes to dry a little and apply the main colour, in my case gray. 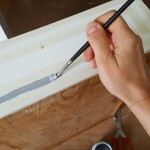 Remove the tape while the paint is still wet. Easy right? 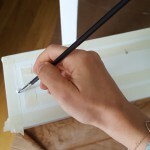 Discovering this simple technique was a total game changer for me. I love all types of stripes and frames, and by using the masking tape trick I finally could make it as crisp and clean as I always wanted. Here I decided to go one step further and slightly distress the whole piece including the frames. 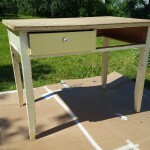 I used a damp cloth and rubbed gently to remove some of the gray paint. 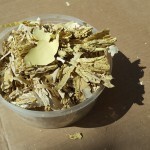 This, plus delicately sanding the edges, helped me achieve vintage Shabby Chic effect. 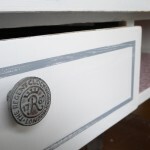 From one-eyed pirate of a table to a delicate vintage treasure.